Just when Rupert Murdoch thought the News Corp. scandals were behind him, two of his closest former associates have been accused of additional crimes. 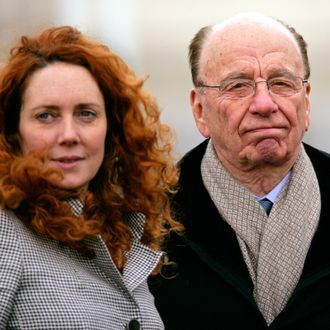 Rebekah Brooks and Andy Coulson will be charged with making illegal payments to public officials, the Crown Prosecution Service announced today, as part of Operation Elveden, which ran simultaneously with the investigation into phone hacking. Brooks and Coulson already face charges for the hacking, while Brooks, who became the CEO of News International after editing Murdoch’s tabloids the News of the World and The Sun, is also accused of covering up the crimes and perverting justice. Both also happen to be super-chummy with Prime Minister David Cameron. Two reporters and an employee of the Defense Ministry will also be charged in Operation Elveden. Brooks and journalist John Kay are accused of paying about £100,000 to the government employee between 2004 and 2011 for stories published in The Sun, while Coulson and notorious phone-hacker Clive Goodman face allegations of illegally purchasing information including “a palace phone directory known as the ‘Green Book’ containing contact details for the Royal Family and Members of the Household.” Now, what could they possibly have needed that for?